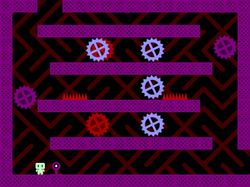 One of the earlier levels, "One by one"
Blocks (working name) is a puzzle game about sticky blocks. 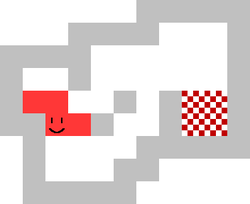 Players move around a sticky block in a grid, morphing its shape, cutting it into many components, sticking them back in order to reach a goal. One of the hardest part in the game. Interdimensional Travel Device (ITD for short) is a platformer game I made for reddit GM48 contest. The contest asked to make a game from scratch (even art/music/sound) using Game Maker in 48 hours with the theme "parallel worlds". Here is the reddit post. Here is where you can get the game (only works for Windows). Relativity is an another game I made for reddit GM48 contest. The theme was "lost". 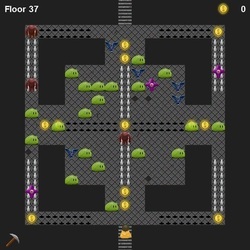 The Tower is the third game I made for reddit GM48 contest. The theme was "Permadeath". MCDS (working name) is a no randomness, perfect information, two-player, turn-based game. It has a simple but unique combat system, which allows very interesting strategy and tactics. It is currently in development by a team of 5. Part of the level, "Supertux visits Edmonton"
These are two Supertux levels made by me for version 0.1.3 (Milestone 1). 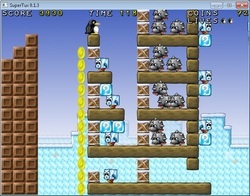 The first level, "Supertux visits Edmonton", focuses on Mr. iceblock usage. 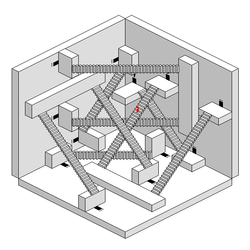 The second level, "Flanders Deathfield", starts out the same as the icicle section in the bonus island level "In Flanders Ice field", but makes the section longer and more challenging.